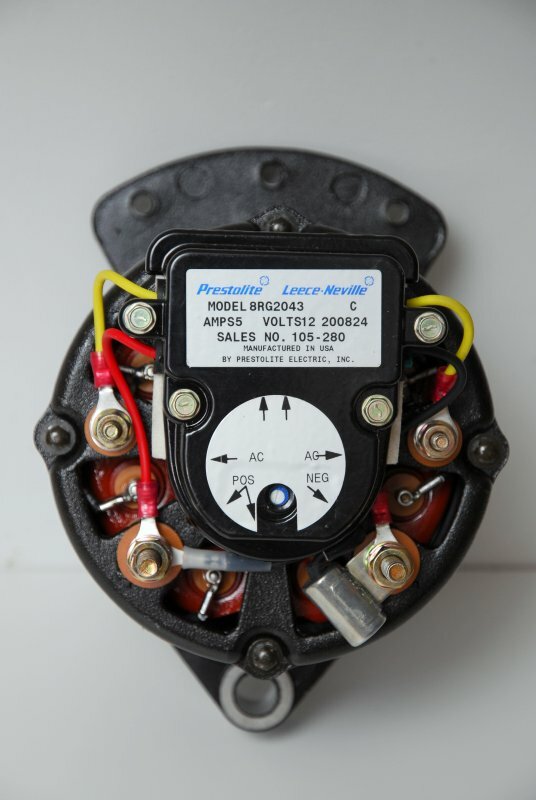 Many boats, both power and sailboats, come equipped with, or have have used, the 5″ small-case Motorola/Prestolite/Leece-Neville style alternator. There are literally thousands of these out there. Even large Caterpillar and Cummins engines have used the 8MR frame. This Motorola style alternator is currently being manufactured by Leece-Neville. The 8MR series, pictured here, are specifically marinized to meet USCG & ABYC ignition protection standards. The 8MR series is available many current ratings from 37A to 105A & available in a 2″ single foot, 1″ single foot, plus single ear and universal ear configurations. The regulators though are all the same old design. While many modern alternators including Denso, Delco, Valeo, Mitsubishi, Hitachi, Paris-Rhine, Bosch etc. etc. etc. use an internal thermistor circuit to reduce voltage as the alternator heats up, for self preservation, the 8MR series does not. Install these alternators on a large enough bank and they will literally cook themselves. The voltage regulator that comes equipped on certain new 8MR series alternators, feature an adjustable voltage but they are still only single-stage (really a two stage BULK & ABSORPTION) not a three stage regulator with no temp protection at all. The stock regulator lacks temp protection, float modes and a myriad of other features external smart-regulators can offer. This regulator has an adjustable output range from 13.8 – 14.6 V. It ships from the factory set at 14.2V. 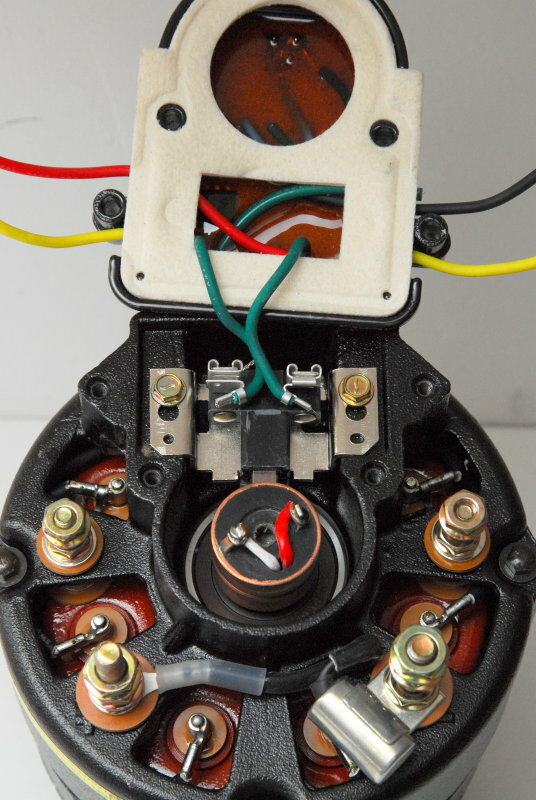 In this article I’ll show you how to convert a Motorola/Leece-Neville 8MR style alternator to external voltage regulation. Once you’ve done this conversion you can then use a Balmar or other external smart regulator. My hands down favorite external smart regulators are Balmar regulators. Why? 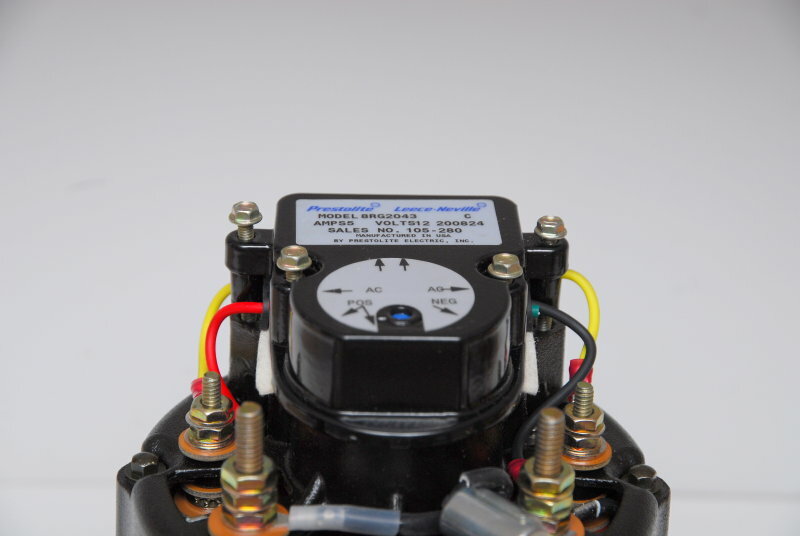 Because Balmar offers more features and programming options than any other regulator on the market. They also have excellent tech support and answer the phone using human beings. 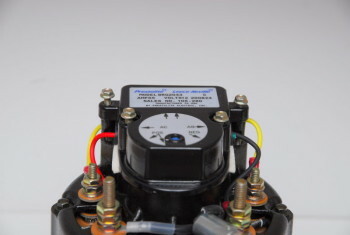 The Xantrex XAR regulator is also made by Balmar for Xantrex. I strongly suggest sticking Balmar though. In regards to Xantrex customer support, well, let’s just say search the net and figure it out for yourself. You get what you pay for with a Balmar regulator and the MC-614 is my hands down favorite. This particular alternator is a 90A Leece-Neville 8MR2070TA with a 1″ foot and universal adjusting ear. It fits many Universal and Westerbeke engines as well as many others. 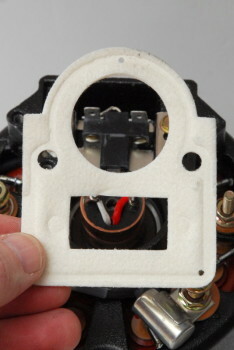 The first step in this conversion is to remove the four machine screws holding the stock-regulator onto the alternator. I’ve loosened them so it’s easy to see which ones they are. 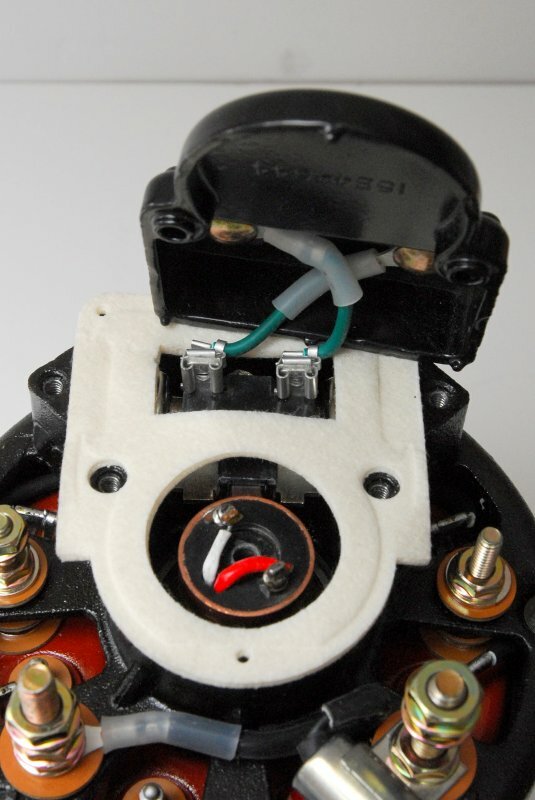 The next step is to remove the four wires that connect the voltage regulator to the alternator. This is as easy and straight forward as it sounds. 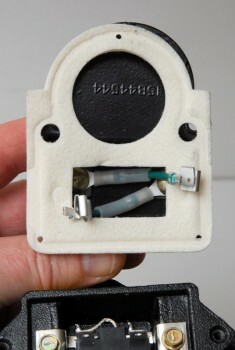 Once the wires have been disconnected simply tilt the regulator up to expose the internal brush connections. You’ll need a set of needle nose pliers to pull the connectors off the brushes. This is quite simple and takes about 20-30 seconds to complete. Aside from the epoxy coated finish of the 8MR series this gasket is what makes it ABYC & USCG compliant for ignition protection. 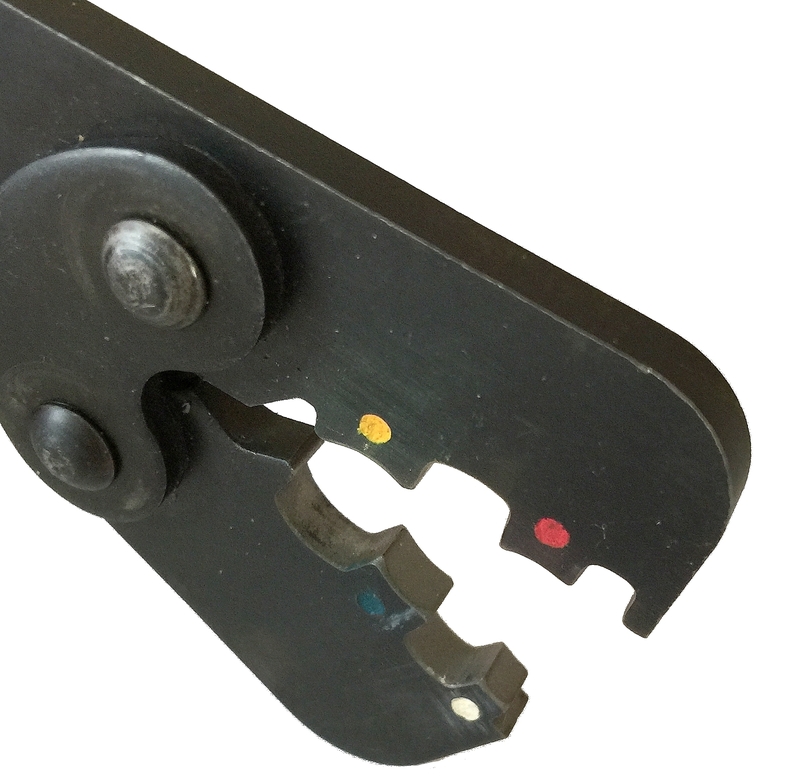 This gasket prevents errant sparks from the brushes from igniting any potential fumes. With most diesel engines ignition protection is not really a huge concern but it’s still a good idea to use this gasket upon reassembly. IMPORTANT: As of June 12, 2017 Compass Marine Inc. was notified that Leece-Neville has discontinued this external regulation kit. We spent an entire year tracking down every last bit of inventory, of these kits, and actually re-imported some from Europe, in order to be able to continue supplying them to our readers. 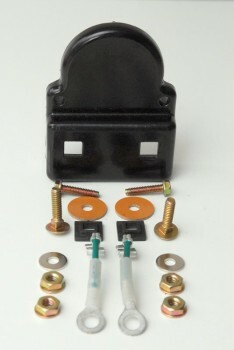 Leece-Neville was nice enough to manufacture an external regulation conversion kit for the 8MR series of alternator. In conversations with LN it appears this kit came about because Balmar used to have Leece-Neville custom build them a version of the 8MR alternator. 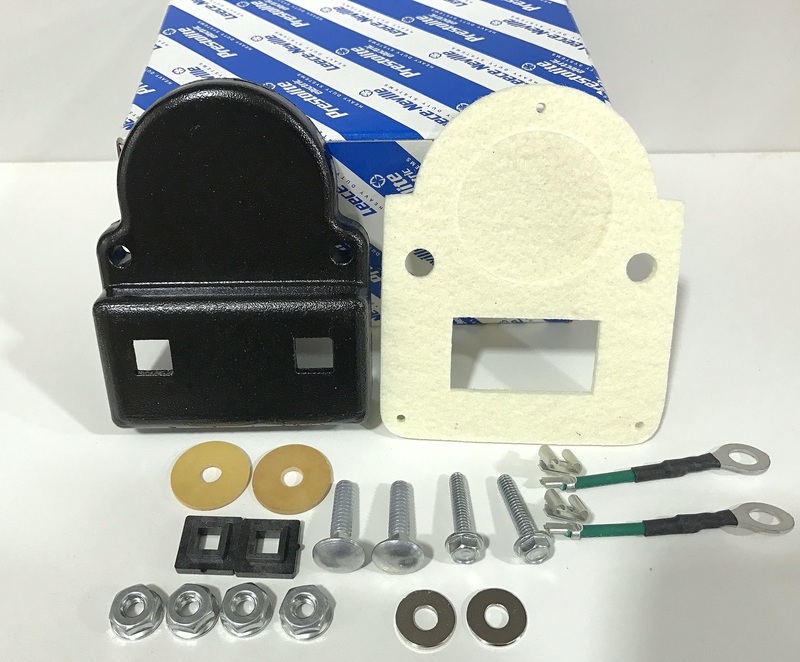 We’ve taken the hassle out of finding these kits (now obsolete) and made them available right here: Leece-Neville 8MR External Regulation Conversion Kit. EDIT: 6/22/18 – We finally have stock again and retail sales of these kits is now open for those who want to DIY. The external regulation conversion kit comes with everything you’ll need, including the wires, bolts and insulators, to make this a simple process. 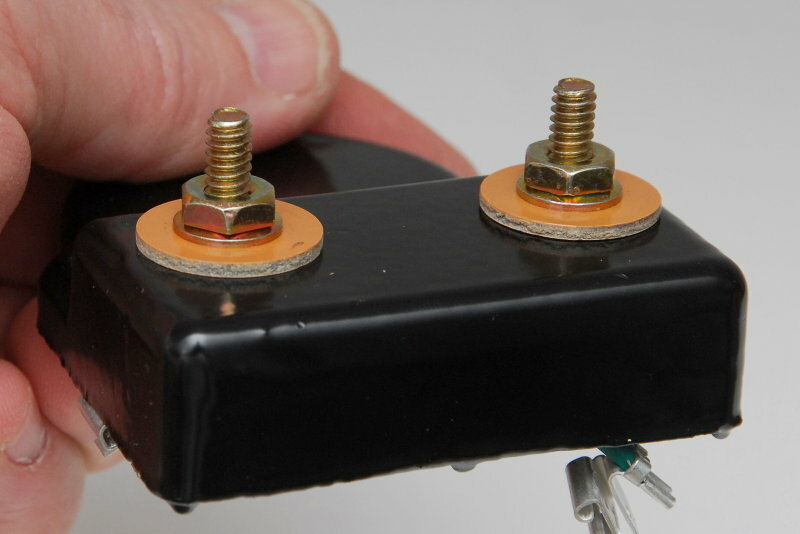 The first step in assembling the kit is to slide the ring end of the wires over the carriage bolts as shown here. Now slide the black plastic insulators over the carriage bolts with the flat side facing the ring and the side with the smaller square facing up as shown. Because voltage & current is running through these wires it’s rather critical they be installed and insulated correctly. If the insulators are not installed correctly, you can literally create a dead short and ground out on the alternator case. This could ruin your day.. 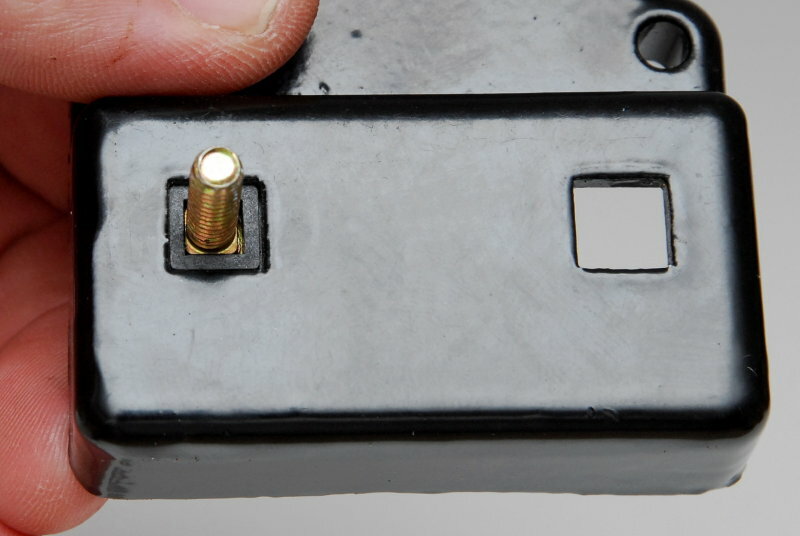 In this image (click image to make it larger) the small square is properly oriented to prevent the bolt from making contact with the cover plate and will be properly insulated. With the studs, and the internal insulators pressed in place install the large insulating washers over the studs. Next drop the two small washers supplied on top of the insulators, add the nuts and tighten them down. Here’s the view from inside the cover plate with the insulators & studs installed & snugged tight. Place the spark arrestor gasket over the conversion plate before connecting the wires. Slide the contacts onto the brush studs in the reverse order you removed the stock regulator wires. It does not matter which way you connect these green wires because one will become the field contact and the other will be connected to the alternators ground stud. 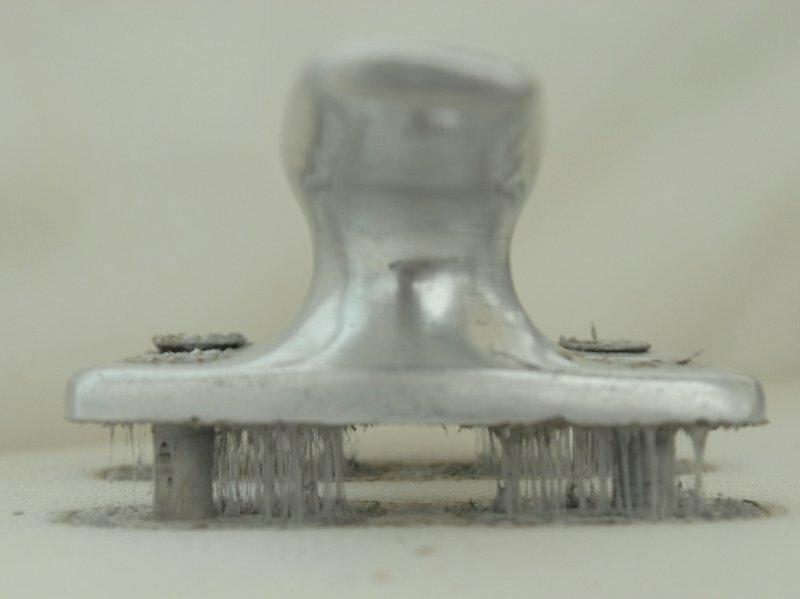 One last detail you will need to do is to create a jumper wire from one terminal of the plate to the B- / Negative stud on the alternator. 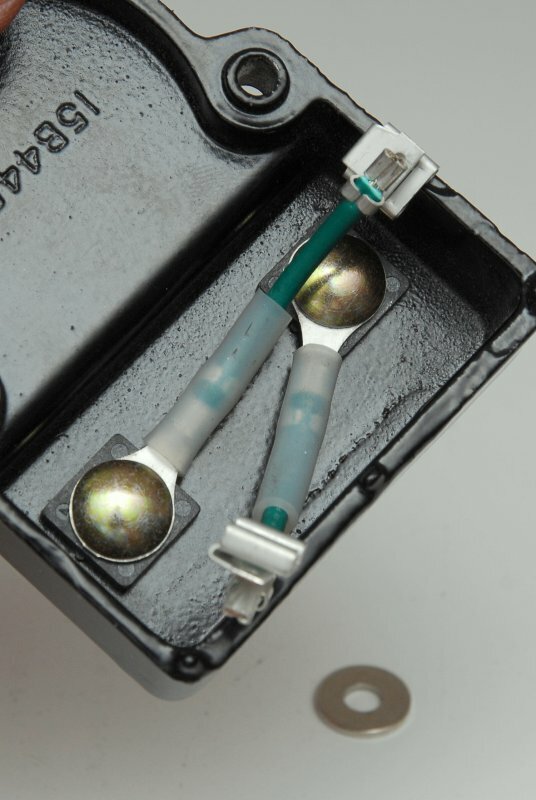 This is the black wire in the photo with the yellow crimped ring terminals. Leece-Neville recommends a 12GA to 14GA wire for this jumper. 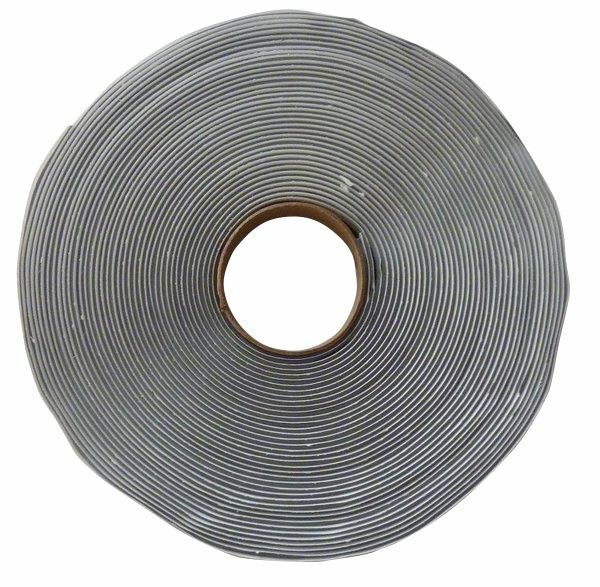 I’d recommend using a 105C tinned rated marine wire. 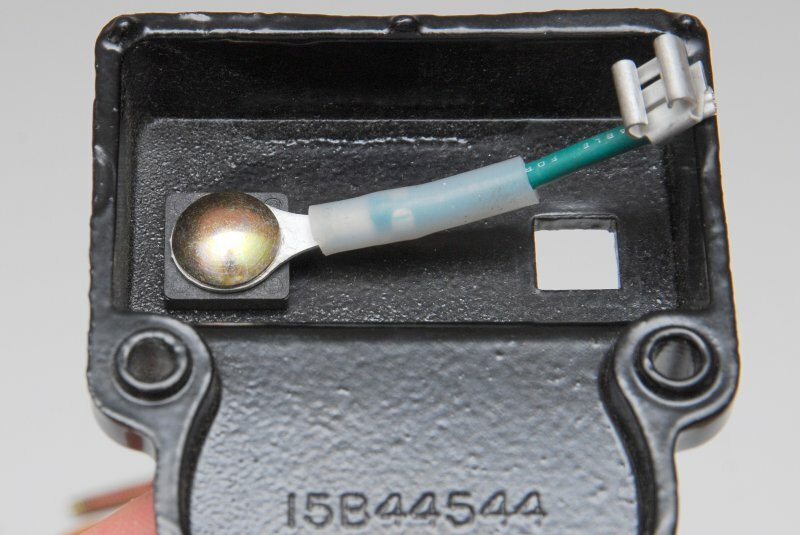 IMPORTANT: If you do not connect one of the cover plate studs to the alternators negative / B- terminal the alternator will not work. The alternators B- / Negative terminal must also be grounded to the ships DC negative bus. Because many of the 8MR alternators are isolated ground (B- stud is 100% isolated from the case) you can not just connect the negative brush to the alternator case and it must be connected to the B- stud. For future reference permanently label the + field stud with a label maker so it’s easy to wire and remember which is which. 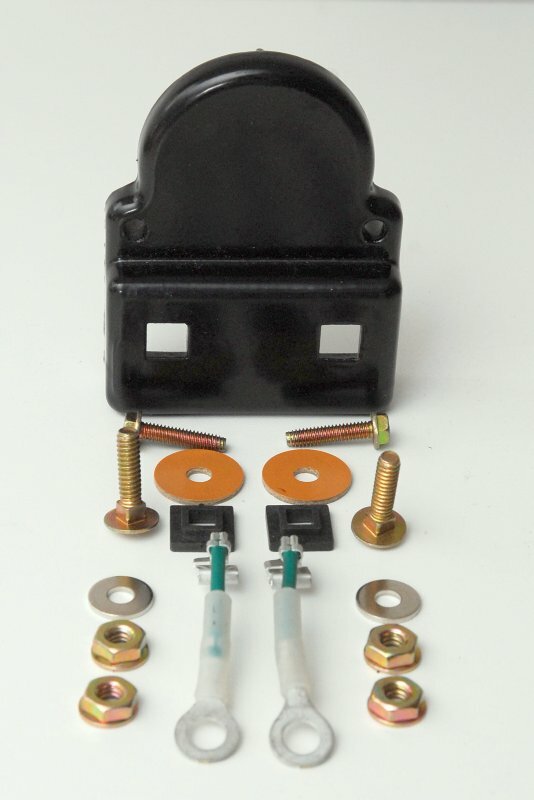 The 12V B+ output stud gets wired directly to the positive side of your boats electrical system. 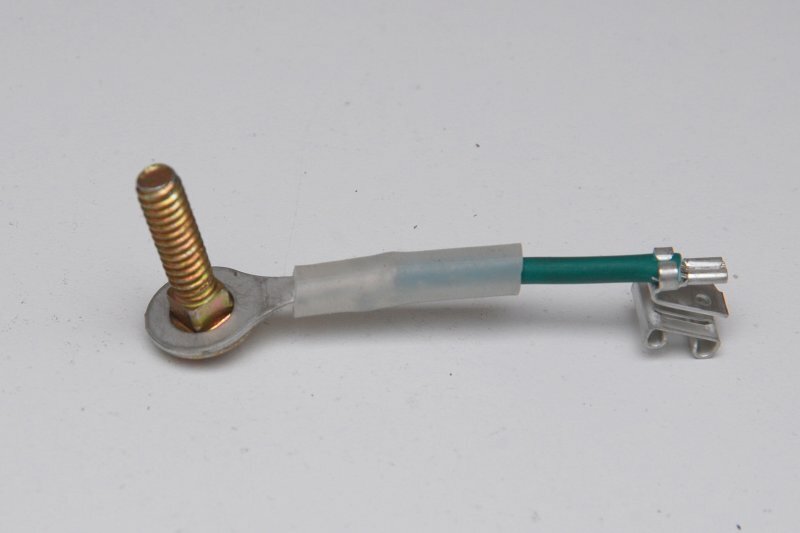 I recommend wiring this directly to a battery bank, preferably the house bank, so you can’t fry the alternator diodes by turning off the battery switch when the motor is running. Please remember that when you wire the alterntor directly to a battery there needs to be a fuse within 7″ of the batteries + terminal post. This fuse should be rated at 150% +/- of the alternators amperage rating. 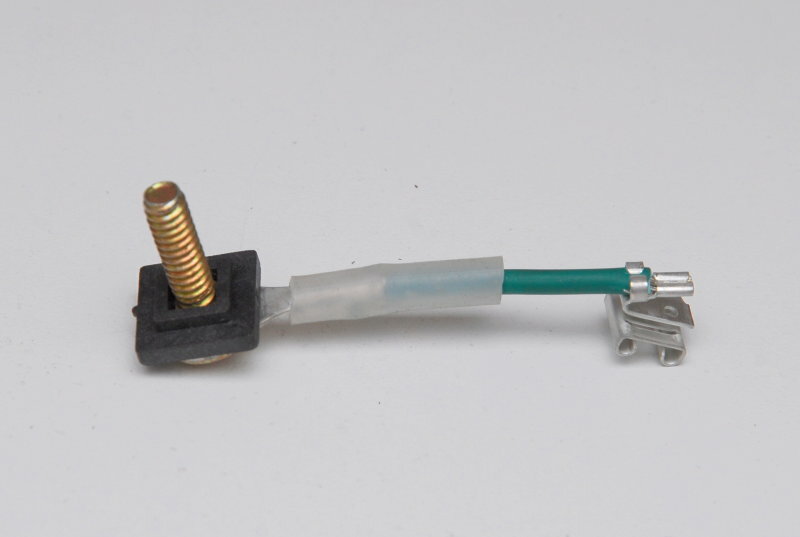 For your diesel engines tachometer, if it’s alternator sensed, simply wire to either of the studs marked “AC Tap”. An AC Tap is also called a “Stator Tap” or “stator pulse” and these stator taps are redundant so either one is fine. Just don’t use both simultaneously, pick one or the other. You may need to re-calibrate your tachometer after the installation of a new alternator. This 8MR alternators are a 12 pole alternator. 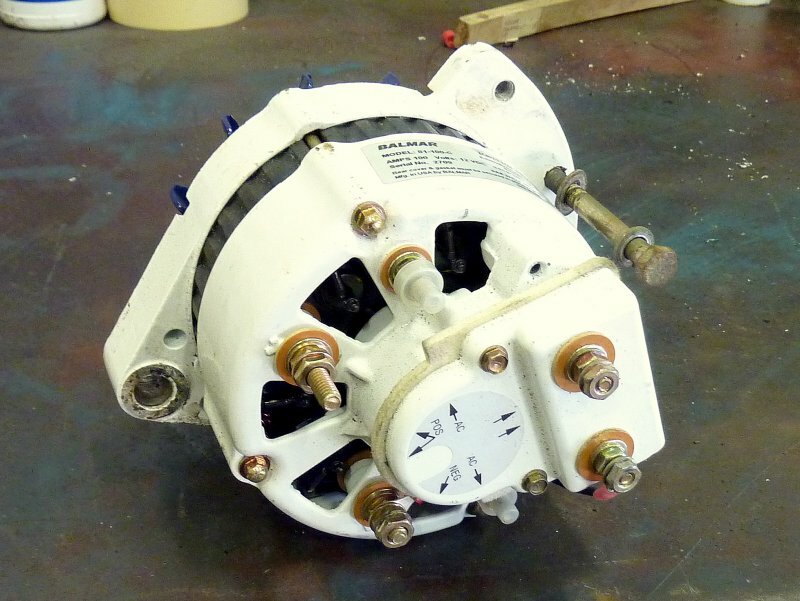 This 90A alternator is now ready to be installed and wired to an external three stage regulator such as a Balmar MC-614 or a Balmar ARS-5. IMPORTANT: If installing this alternator to charge a large flooded bank, AGM or GEL batteries you will need an alternator temp sensor. You will also want to use Belt Manager Level 3 or 4. Belt Manger is a permanent reduction in the maximum field voltage to essentially current limit the alternator to a lower output. This helps the alternator survive driving large loads where maximum output could be required for 30 minutes or more. These are good little alternators but they are definitely not a true high performance alternator. They need and require adequate protection from overheating events. 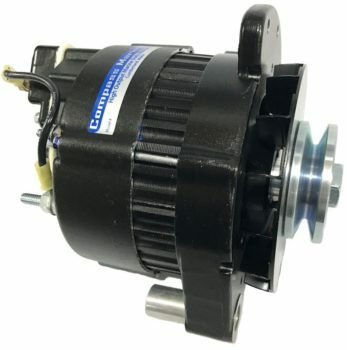 DISCLAIMER: While these are good alternators they are not a true high output medium duty or continuous duty alternator. They are really a medium/light duty alternator. They can be quite reliable but when pushed hard they will not last nearly long a as a purpose built high performance alternator. You can build one of these alternators for about $385.00 or approximately half the price of a purpose built high output marine duty alternator and if you protect it from over-temp you will get long life..
Once converted in this fashion this alternator will be a “P Type” or positive field alternator and can be used with external regulators such as Ample Power, Balmar, Xantrex & Sterling. My personal preference for external regulation is Balmar. This is a genuine Balmar Model 81 not the alternator you saw above just painted white. I have had both a Model 81 and a Leece-Neville 8MR apart on the bench and they share many similarities both on the inside and out. Balmar no longer sells the model 81 and it has been replaced by the newer 6 series alternator. The 6 series is a very, very good alternator, with better performance, and a more robust build than the the Model 81. For many years Leece-Neville has been one of the OEM suppliers to Balmar, and they still are for some alternators. 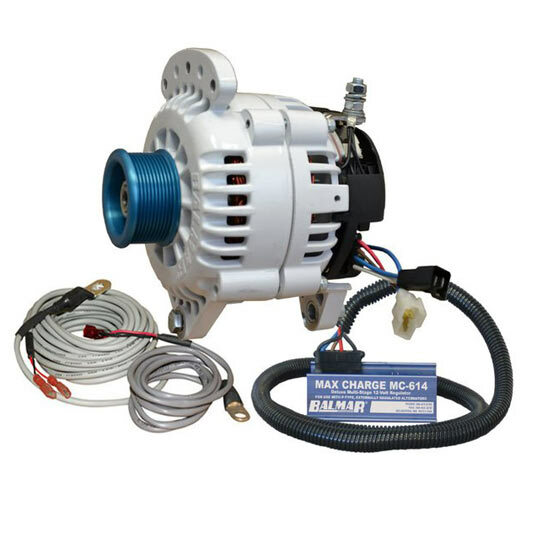 Today most Balmar alternators are physically built in-house by Balmar. If your goal is pushing an alternator hard, with a large battery bank or you have AGM or GEL batteries you would be wise to consider a better & more robust alternator. The newer Balmar 6 series small case alternators are a big leap forward in terms of better cooling, and higher output for longer periods, but if you don’t need that type of performance the 8MR is a decent low cost option to pair with a Balmar regulator when set up for external regulation. When setting a regulator up for the 8MR series I recommend at least Balmar Belt-Manager level 3 or 4. 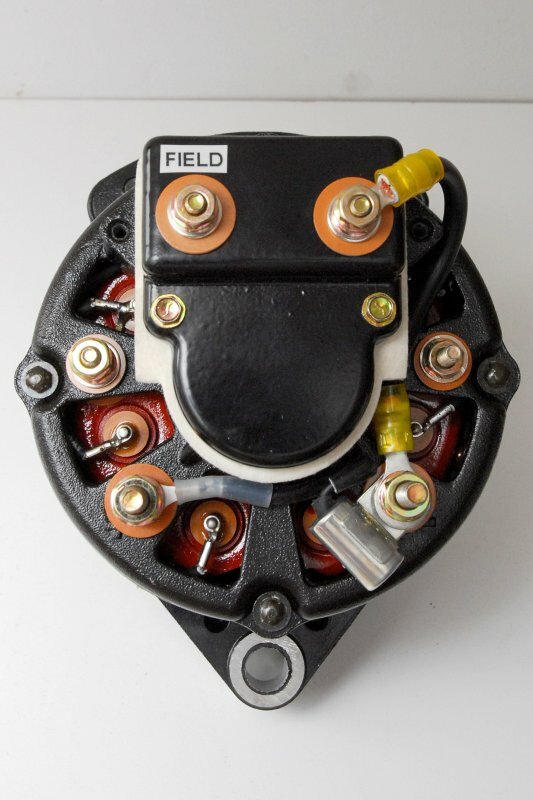 This will de-rate the available current output of this alternator and allow it to run into large loads for longer periods of time with less risk of over heating. Running these alternators wide open/full fielded into large loads for long duration’s will eventually cook them. Use alt temp sensing as added insurance and Balmar’s Belt Manager as your primary tool to keep these running cool. After numerous requests for a completed alternator package we am now offering the CMI-105-ER or CMI-90-ER. This is a 105A alternator already converted to external regulation. They ship complete with a custom machined 3/8″ or 1/2″ billet machined pulley, high copper content brushes, high output rectifier, and the 1″ to 2″ spacer & shim kit. These alternators are hand built in the CMI shop.